Maintaining fish in a healthy condition is the goal of every pond keeper. Raising fish can be an immensly pleasurable experience; Koi are ornate members of the carp family and are easily identified by their whiskers. Their striking patterns and vivid colorations of rich black, white, yellow, orange, blue or red and along with their impressive potential size make them popular pets. They can live up to 25 years or more with proper care. Goldfish are hardy fish and do relatively well even in poorer water conditions. There are many varieties available; Comets, a popular goldfish for ponds and water gardens where they add such beuty with their long slender bodies, typically solid orange with a metallic appearance. Shubunkin have longer, thinner bodies and are typically shaped like traditional goldfish. Shubunkin can have a long tail fin and wide rounded fin lobes and are primarily bred and enjoyed for their beautiful colors. Fantails are shorter and rounder and are distinguished by a divided caudal fin which is usually longer than the common goldfish tail. 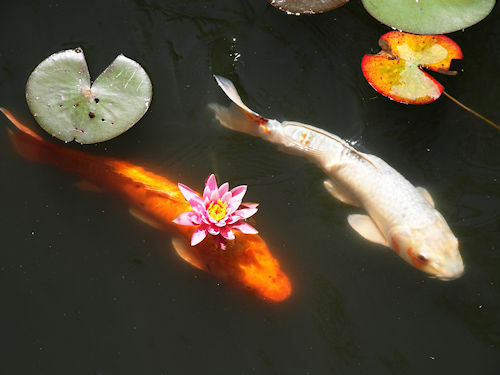 Understanding the signs and symptoms of disease and stress and proper winterizing of koi and goldfish along with proper nutrition and habitat will allow you to keep your fish happy and health for years. Fish health is very important in your pond. Not only does the ecosystem have to work but the type of food, the time of year and the temperature play a role. Our line of high quality fish food can help feed any time and at any temperature. Ideal for goldfish and prized koi fish. When it comes to food, we have you fed! From cold water blends idea for fish ponds in Canada to blends that help enhance the colors of the fish. Take care of your living jewels with fish food in Canada from Atlantic Pond Supply. The Variety Mix™ fish food is a high quality food and a great way to feed a blend of fruits, greens, carbohydrates, protein, wheat germ and vitamins to your fish. This food is a combination of Summer Staple with fruits and greens, Summer Staple Growth & Energy and Summer Staple with Montmoril..
Microbe-lift PL™ provides sustained biological activity in water temperatures even under 55 degrees. It helps to reduce ammonia and nitrogen levels and reduces organic waste build up. PL will seed and maintain biological filters and will improve dissolved oxygen levels. It digests organic sludge,..
Saki-Hikari® Color Enhancing Koi Food Saki-Hikari® Color is a color enhancing food pellet that is Koi-breeder preferred due to the specialized living formula that is recommended in an aggressive color enhancing diet. Saki-Hikari® Color has been developed in Japan to be the most powerful co..
CrystalClear® Staple floating fish food contains a balanced nutritional formula for all pond fish. This balanced blend of vitamins, minerals and amino acids are perfect for everyday feeding during the warmer months. CrystalClear® contains a minimum of 32% protein. Balanced Nutrition for Summe..
Broad Spectrum Disease Treatment™ from Microbe-Lift® is the safest and most effective treatment for the control of diseases caused by Ichthyophithirius (Ich), Costia, Trichodina, Chilodonella, Oodinium and fungal infections. For small fish ponds in Canada we recommend this treatment for goldfish ..
Feed your pond fish Microbe-Lift Legacy™ Cold Weather Fish Food during the colder weather periods of spring, fall and winter when nighttime temperatures can go below 12°C (55°F). When pond temperatures drop, your fish require a highly digestible cool-water diet, making this an ideal winter fish f.. This premium fine mesh pond netting comes in two mesh sizes: 3/8" or 3/4". The small 3/8" mesh are the smallest fish netting covers available. Pond net keeps autumn leaves out of the pond as well as pine needles or other windblown debris from entering your pond. Constructed of heavy-duty UV-resis..
High Growth & Energy Legacy Fish Food This high quality food is great for late spring feeding when fish need to replenish fat reserves and is also great in early fall to help them bulk up. When warmer water temperatures arrive, koi & goldfish need a boost of protein for growth sinc..
Hikari® Spirulina is a supplemental finishing diet for feeding your quality koi. Used mainly prior to a show as a finishing feed and when water temperatures are higher, this exceptional formula rapidly promotes rich, natural coloration as a result of the ideally blended color enhancing ingredient..
CrystalClear® KnockOut™ PLUS is widely used by pond and aquarium hobbyists and professional as a broad spectrum treatment working on parasites, bacteria and fungus. CrystalClear® KnockOut™ PLUS is formulated to work with all pond fish especially koi and goldfish. When used in accordance with the ..
For treatment of praziquantel-susceptible disease conditions in ponds. Liquid PraziPro is a ready-to-use, liquid concentrate that was developed to offer an effective way to control unwanted parasites in ponds. Extremely safe and super effective this revolutionary product offer you rapid control y..
Summer Staple™ Fish Food This high quality food has animal protein and color enhancements that are needed through the season. The color enhancers are made of up crab shell, spirulina and krill-all. When warmer water temperatures begin increasing the frequency & quantity of your feed.. When Your Bigger Fish Deserve the Very Best! For big fish these big bites come in a big bag! 40lbs of Big Bite Summer Staple fish food in a extra large pellet format. Summer Staple floating pellets in a larger pellet size (0.7-1.1 cm) for feeding your larger Koi has the animal protein and col.. Dogs and cats love to have a little treat now and then so why not your koi and goldfish? Koi Krunchies are the perfect treat for your finned friends! Made with natural citrus flavors, Aquascape Koi Krunchies are a wonderful addition to your fish's regular diet. Koi Krunchies are ideal for hand fe..
Parazoryne Parazoryne is a unique herbal preparation which helps support fish recovering from skin flukes (Gyrodactylus), gill flukes (Dactylogyrus), ich (Ichthyophthirius multifillis), Oodinium, Costia (Ichtyobodo necator), Chilodonella and Trichodina. Parasitic infestations are characteriz..
Aquascape Premium Cold Water Fish Food Pellets have been scientifically formulated to provide premium nutrition to all pond fish including goldfish and koi at colder water temperatures. The inclusion of Spirulina and Wheat Germ helps make the food easier to digest at colder temperatures. Bacillus..
Aquascape Premium Staple Fish Food Pellets have been scientifically formulated to provide premium nutrition to all pond fish including goldfish and koi. The 1.2 pound and 2.3 pound bags contain medium pellets and are best for smaller goldfish and koi. The 4.6 pounds, 22 pounds and 44 pound supply..
Sabbactisun Sabbactisun is a unique herbal preparation which helps support fish recovering from bacterial infections, with symptoms such as fin and tail rot, ulcers, bulging eyes (exophthalmia), milky skin, raised scales, mouth rot/fungus and dropsy (ascites). Sabbactisun supports the natural..
Aquascape Premium Color Enhancing Fish Food Pellets have been scientifically formulated to provide premium nutrition to all pond fish including goldfish and koi. The inclusion of Spirulina, Krill meal, and Astaxanthin helps to promote brilliant fish color. Ideal for large fish 8 inches, (20 cm.) ..
For treatment of Ich disease conditions in pond fish. Liquid Ich-X is a ready-to-use, liquid concentrate that was developed to offer an effective way to treat Ich with a less toxic form of malachite green. For best results follow directions, treating fish with Ich is best accomplished by us.. These sturdy telescopic skimmer/cleaning nets and pond fish nets are perfect for the delicate handling of prized fish as well as surface skimming and debris removal. We offer 9 specific pond nets to fit the job you need to do from regular mucking out of debris or gently handling your fish. P..
Everything you need to maintain a superior environment for your aquatic pets is in one bottle. For new setups ®Ultimate instantly “ages” water allowing you to enjoy your pets in action quicker without fear of the negative impact of toxic chloramine, ammonia, chlorine, heavy metals or nitrite. ..
Chlorine is toxic to fish. Left untreated chlorine can cause gill damage and leave fish unable to breath. The liquid Vanish PLUS has additional properties and removes chlorine, chloramine & heavy metals and adds fish slime coat protectant Vanish™ Plus Liquid Dechlorinator PLUS Stre..
Wipeout™ Bacterial Control by Crystal Clear® is excellent for treating fish gill diseases such as Fin Rot and Ulcers in pond fish.WipeOut Bacterial Treatment is excellent for controlling gill diseases in pond and aquarium fish. Bacterial diseases generally result from fish stress due to adverse w.. When Your Small and Baby Fish Deserve the Very Best! For small and baby fish up to 4 inches long, these mini bites come in a big bag! 40lbs of Mini Pellet Summer Staple fish food in a extrasmall pellet format. Summer Staple floating pellets i has the animal protein and color enhancers that ar..
CrystalClear® ParaSalt™ is formulated to increase koi and goldfish electrolytic intake. Electrolytes are critical in building and maintaining a healthy slime coat. Electrolytes such as potassium are essential in wound repair and in times of heavy stress (ie – during water changes or clean-outs). .. These Hikari blends are three of the most popular fish foods for serious koi breeders and goldfish pond owners who want the very best for their fish. The Staple, Gold & Wheat Germ formula each can provide specific benefits from ensuring proper nutrution during cold months to enhancing colors ..
Quickly & Safely Lowers pH Increases Fish Electrolytic Uptake Safe For All Aquatic & Domestic Animals pHusion® fuses pH lowering qualities with natural electrolytic supplements to safely lower pH levels in pond water at no more than 0.2 points per application. pHusio..
Aquascape Pond Salt helps reduce the effects of elevated nitrite levels toxic to pond fish. Aquascape Pond Salt helps restore natural electrolytes allowing proper gill function when pond fish are under stress. Also helps repair and promote a natural slime coat necessary for disease prevention. ..
Vanish™ Dry Dechlorinator Immediatly removes chlorine from the pond making water safe for plants and fish. One ounce dry Vanish™ treats 5,600 gallons. 8 ounces treats 24,000 gallons 32 ounces treats 96,000 gallons 25 pounds treats 1,200,000 gallons CrystalCle..
Microbe-Lift TheraP™ - Specially Formulated Beneficial Bacteria to Promote Fish Health. Provides a natural pond eco-system, resulting in better overall fish health and improved water quality for use with all ornamental, coldwater, temperate, cyprinids, native and wild species. M.. The economy Hikari® blends are popular fish foods for serious koi breeders and goldfish pond owners who want the very best for their fish. A uniquely balanced diet rich in the necessary nutrients help pond fish look their best. Contains a precise amount of stabilized Vitamin-C to support immune s.. These Hikari® blends are three of the most popular fish foods for serious koi breeders and goldfish pond owners who want the very best for their fish. The Staple, Gold & Wheat Germ formula each can provide specific benefits from ensuring proper nutrution during cold months to enhancing colrs ..
Nualgi Ponds™ is a patented liquid formulation for ponds now available in Canada. It is a safe and natural treatment for ponds that helps grow beneficial diatoms in the water and these friendly diatoms compete against the nuisance algae for nutrients. Diatoms are single-celled alga that has .. Liquid CyroPro™ is a ready-to-use, liquid concentrate that was developed to offer an effective way to control conditions caused by anchor worm and fish lice in ponds, freshwater and marine aquariums. The concentrated liquid is extremely safe and super effective, providing rapid control pf potenti..
Pond salt helps reduce fish stree and reduces the threat of parasitic disease in pond water. Pond salt crystals are specially formulated for ponds and fish ponds and contain no additives and are nitrate and phosphate free. Improve health and vitaility of aquatic plants. Will help ..
CrystalClear® WheatGerm floating fish food is designed for the cooler months of the year. This wheat germ formula is easily digestible and perfect for transitioning koi and goldfish into and out of the colder months. CrystalClear® WheatGerm contains a minimum of 28% protein. Balanced Nutritio.. It is said the secret to healthy, colorful, Japanese koi is the clay mud in which they are raised. MICROBE-LIFT/Calcium Montmorillonite Clay comes from one of the highest calcium clay deposits in the world. Calcium based clay may help your pond water to produce some of the healthiest and dee..
ProForm-C™ is a concentrated formulation of formalin and malachite green. It is based upon the famous Leteux-Meyer formulation, published in 1973, for treating ichthyphthiriasis ("ich") on scaleless catfishes. Leteux and Meyer found that the formulation they developed was not only more effective .. When used as directed, CrystalClear® pHGuard™ will stabilize pond water pH and maintain buffering capacity as safe levels between 80-240 ppm. CrystalClear® pHGuard™ will help prevent wide pH swings which are typical from morning to night. CrystalClear® pHGuard™ makes pond water safe for fish and ..
An ideal medium for koi and carp spawning. This is a safe and soft brush that has soft and supplebristles that will not harm fish eggs yet are sturdy enough to allow the koi eggs to adhere and grow in a safe environment. These fish spawning brushes, also called spawning ropes, are made from a sof..
Ammonia Neutralizer pro is a 25% more concentrated version of the standard Ammonia Neutralizer offered by Aquascapes. The PRO version detoxifies chloramine in tap waters and instanly neutralizes toxic ammonia to protect your fish and plants. Sold in 1 Gallon Jugs. Liquid formula Ammo.. It's not often you will see an alligator in a pond in Canada! This floating decoy adds a bit of whimsey while scaring off would be pests and predators who will certainly think twice about swooping down to grab your koi fish when they see the sharp teeth of this floating, sectional aligator. ..
Aquascape Pond Detoxifier makes tap water into pond water. Because tap water including well water often contains chlorine, chloramines and heavy metals, that if left untreated can cause damage to the pond ecosystem. Aquascape Pond Detoxifier eliminates chlorine, chloramines, ammonia and chelates ..
PraziPond Plus Praziquantel (“Prazi”) is the preeminent treatment for flukes. ‘Prazi’ is by far the most gentle, yet effective treatment for flukes available to our hobby. The real bonus with ‘Prazi’ is that when you treat for flukes it also rids the fish of any internal parasites or worms. ‘..
Alkalinity Booster with Phosphate Binder Increases Overall KH/pH and Alkalinity Lab tested and pharmaceutical grade Dissolves completely and easily in pond water Phosphate and ammonia free 1 lb - Treats 5,000 gallons Product Number: 96027 9 lbs - Treats..